Hover over the image above to click through and purchase these Huggies products! 1. Use an over the door shoe organizer for storage. We received a lot of swaddles, burp cloths, and towels as gifts, and they are definitely very necessary for a newborn. However, when it comes to storing them they take up a lot of room in the nursery. 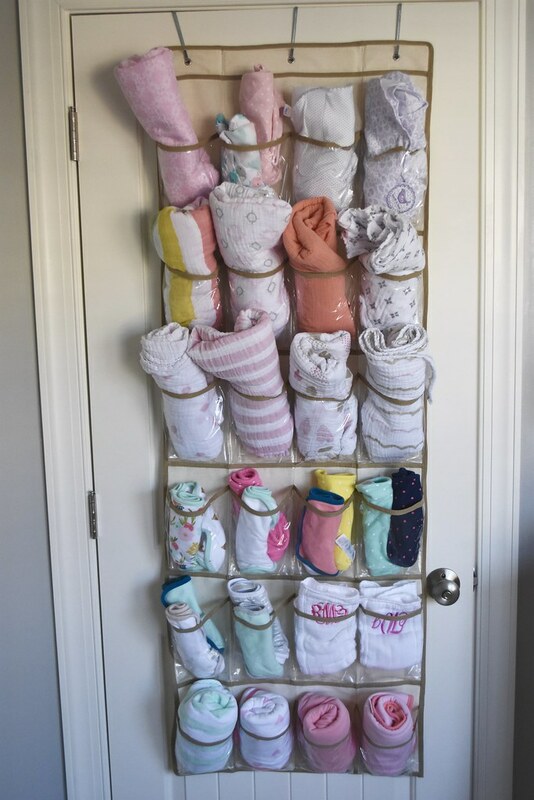 We decided to get an over the door shoe organizer and store the swaddles, burp cloths, and towels by rolling them up and placing them in the pockets to save space. 2. 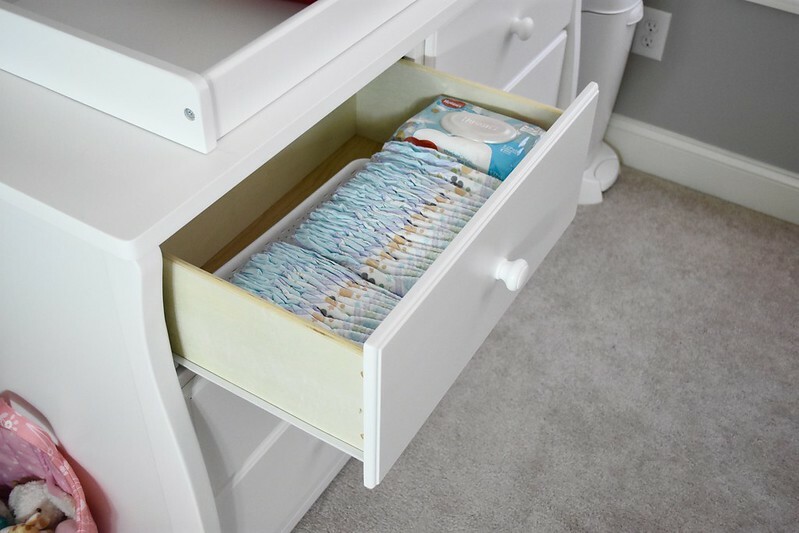 Store diapers and wipes in the dresser. We have a dresser in Baby W’s room that we will be using as her changing table. We decided to use one of the top drawers as storage for diapers and wipes because it’s really convenient. We also have boxes of various different size diapers in the closet that we can easily grab when the drawer starts running low. 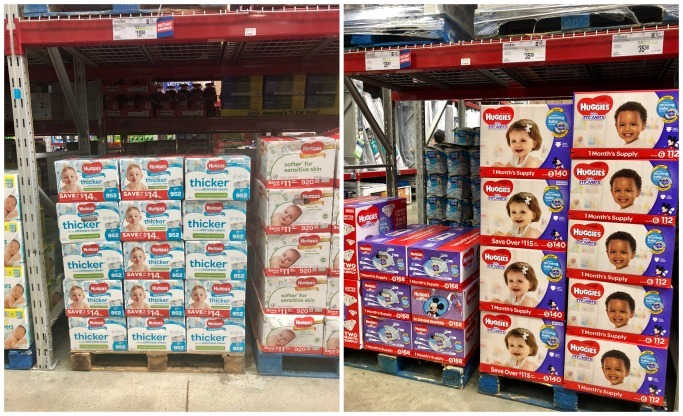 When it comes to diapers and wipes, we purchased Huggies® Little Movers and Huggies® One & Done Wipes from Sam’s Club because we love taking advantage of already low prices! Now through Christmas Sam’s Club is offering $4 in instant savings when you buy any 1 Huggies® product, and you can also get an additional $4 savings through Ibotta. 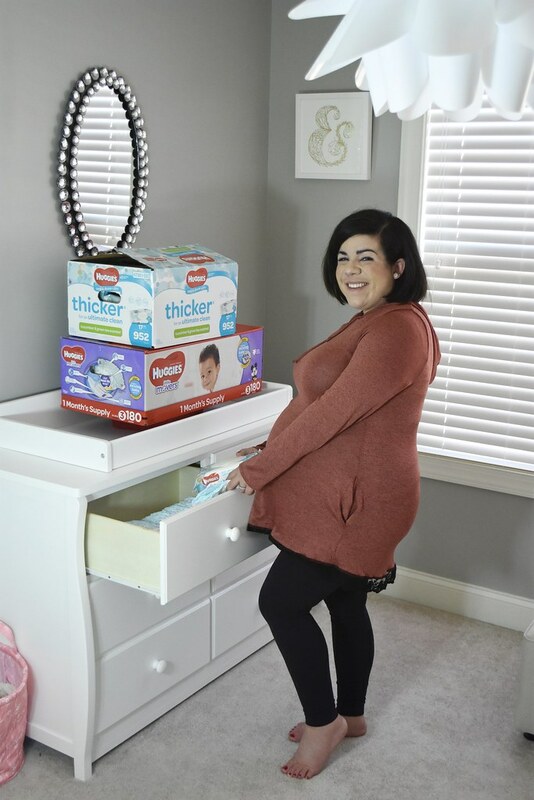 We received a lot of newborn, size 1, and size 2 diapers as gifts, so one of the products I purchased is Huggies® Little Movers diapers in size 3 which have the best fit to hold the diaper in place during active play. These will be perfect once she’s a little older! 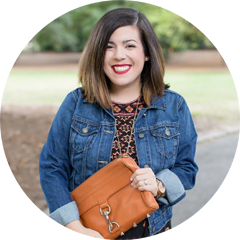 I really like that Huggies® are designed for a comfiy fit over time no matter what stage your baby is in, and they have diapers available from newborn all the way through potty training which is perfect. I also purchased the Huggies® One & Done Wipes which are the #1 branded wipes, and they have a cucumber and green tea scent. Sam’s Club also has a pick-up service which is one of my favorite services and why I love shopping there! You just order everything online and they have everything ready for you when you arrive. 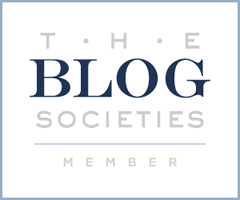 It’s definitely a great service to take advantage of with a new baby! 3. 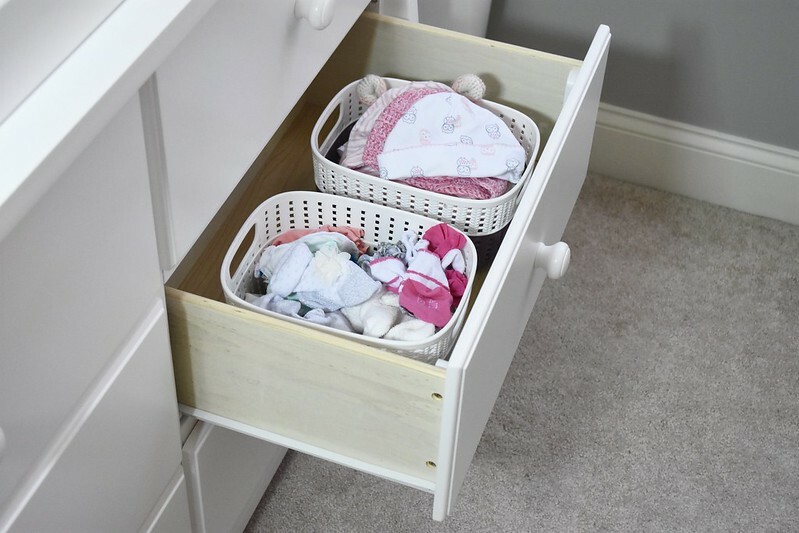 Use small bins in the dresser drawers for small items. Before we purchased small bins these items were just getting lost and moving around in her drawers. I picked up one bin to store her socks and mittens in, and then another bin to store all of her hats in. This definitely helps with organization and makes things a lot easier to find! What are your nursery organization tips?